Selection can we select multiple items, do we enable keyboard selection and if so, how does it grow ? Controls Safari shows a progress bar and a clickable cancel/reveal button for each downloaded item. 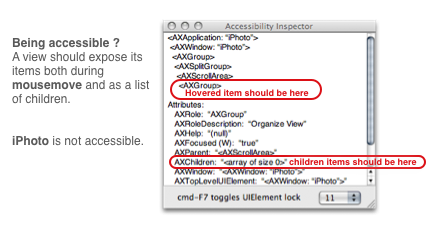 Accessibility the list should be usable by most, Accessibility Inspector lets us check that. There does not seem to be an official standard for selection, which will grow any way it pleases. Daring Fireball talked about anchored selection in Cocoa table views. Cocoa collection views still dwell in yore. Delicious Library's item list selects in a way I don't understand. I stress selection because I've spent most of my computing life on Windows where selection is anchored. I bought TextMate for one reason : selection actually works ! Bundles ? What bundles ? Don't care about bundles. Selection works ! Selection implement ourselves. Anchored, please ! 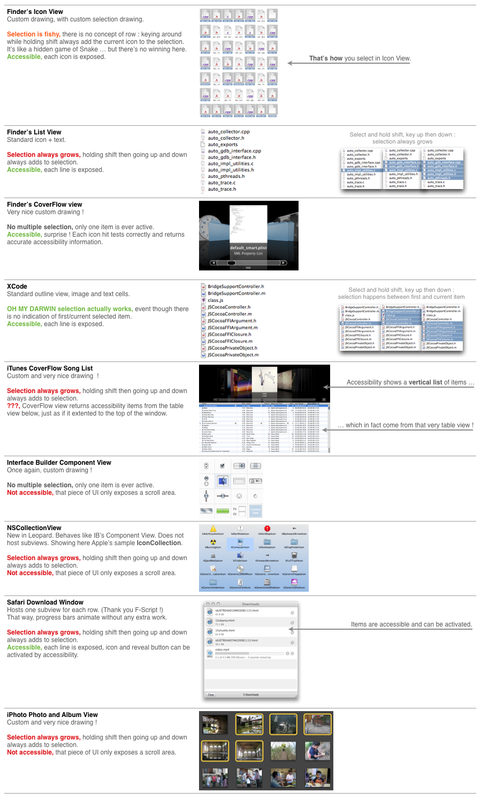 Controls to host a live control, the best way seems to do like Safari : each row is one instance of a custom NSView.